Learning how to read your own water meter will help you to understand how much water you are using at your property at any given time, and will help you in your conservation efforts. 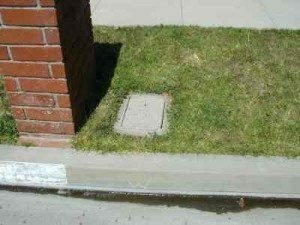 First you will need to locate your water meter box. Generally the meters are in front of your house, on the property line. Look for a rectangular box that is flush with the ground (similar to the one pictured on the right). You will need a tool of some sort to remove the lid from the box. A screwdriver should work, but if you need our staff to help you, please call our office at 415-868-1224. Once you locate the meter box and remove the lid, you should see a meter similar to the one pictured below. You may, however, find that the meter box is full of dirt. This is usually due to our ever-present gopher “friends”. If the meter is full of dirt or other debris, you will need to dig it out of the box to gain access to your meter. Reading your water meter is similar to reading the odometer in a car. Read all the numbers from left to right that appear under the words Cubic Feet. The first digit on the right represents one cubic foot, the second digit from the right represents 10 cubic feet, the third from the right represents 100 cubic feet and so on. One revolution of the water meter sweep hand (the dial pointing between 1 and 2) equals 1 cubic foot or 7.48 gallons. One revolution of the water meter sweep hand (the dial pointing between 1 and 2 in the photo below) equals 1 cubic foot or 7.48 gallons. You may have an older meter that looks slightly different than the one pictured below, however all meters fall under the same general parameters. Note, if the white triangular dial is moving, there is water running through the meter. We suggest that you start with a 24 hour meter read to find out how many gallons are being used at your property in a day. The first time you read your meter, write down the numbers indicated in the Cubic Feet window. Wait 24 hours and re-read your meter. Subtract the prior reading from the second one and multiply the difference by 7.48. This will give you the number of gallons used at the property within the 24 hour period that you read the meter. If you suspect that you may have a leak, please do the following: Turn off all faucets and water using plumbing fixtures or appliances. Don’t forget any outside fixtures. Mark the position of the meter sweep hand lightly with a pencil and/or note the reading on your meter. Wait approximately 30 minutes before rechecking the meter. If the sweep hand moved, a leak is indicated. If you suspect that you have a leak on your property, call our office at 415-868-1224 (24 hours a day) so that we can turn your meter off to stop the water loss, and then contact a plumber immediately to find and repair the leak. As our update letter explains, as of January 15, 2014, the BCPUD is calling for a Heightened Voluntary Conservation Alert. This means that we are asking our customers to reduce their water use by 25% and tocease all landscape watering (including automatic irrigation systems and hand watering) until further notice. Additional information about the voluntary conservation alert and at what point the district will impose mandatory rationing can be found in the first half of this mailer. Never pour water down the drain when there may be another usefor it. Use it to water your indoor plants or garden. Avoid wasting water waiting for it to get hot. Capture it for other uses such as plant watering or heat it on the stove.